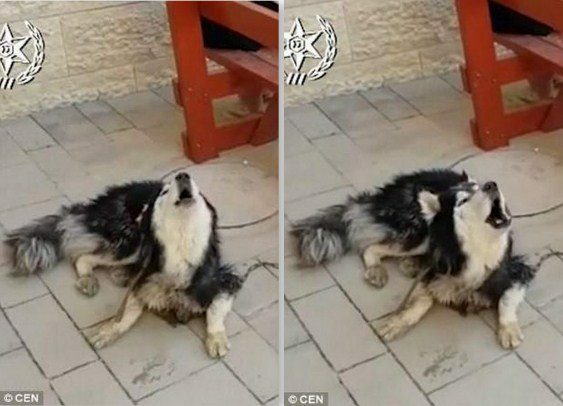 This is the heartwarming moment police identified a missing dog by testing to see if it could ‘sing’ along to its favorite tune. The Siberian Husky was played a few songs before it burst into a series of ear-splitting howls when his track was played. When the dog was found the suspected owner was contacted who insisted they would be able to identify him by playing two songs. 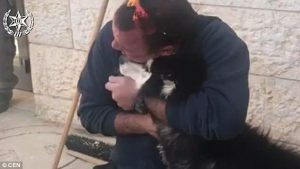 The owner said that his husky would sing along to the Israeli sitcom Shemesh theme tune or introduction to the children’s programme, Arthur. He had been reported missing by his owner who lives in the city of Beer Sheva, in the Southern District of Israel. A dog that matched the description of the missing husky was spotted by police officers when they were out on patrol. The husky was found with a group of teenagers who said that he looked malnourished when they found him in a field. Suspecting that it might be the missing dog, police contacted the owner – who was not identified – to suggest that he drive over to check. He said that was not necessary – they would be able to tell if it was his animal when they played the theme music to the programmes. The video shows the instant, unmistakable reaction when officers played the right songs using the unusual identification method. After officers passed on the good news, the overjoyed owner and beloved pet were then seen enjoying an emotional reunion.